Chemically synthesized phosphopeptide derived from a region of human PAK2 that contains serine 141. The sequence is conserved in rat and rabbit. Cos cells transiently transfected with PAK 1, PAK 2, or PAK 3, and co transfected with V12 Cdc42 and grown either as adherent cultures to activate PAK, or placed in suspension to suppress PAK activation. P21-activated kinase (PAK) is actually a family of serine/threonine protein kinases, members of which are activated by small molecular weight GTPases. The three most common isoforms are PAK 1, PAK 2, and PAK 3 (also known as alpha PAK, gamma PAK, and beta PAK, respectively). These kinases contain numerous regulatory elements that trigger diverse signaling processes such as those initiated by activated GTPases, interaction with Src homology 3 (SH3) domains, and caspase mediated proteolytic cleavage. Autophosphorylation of serine 141 (serine 144 for PAK 1 and serine 139 PAK 3), catalyzed by Cdc42, is required for activation of PAK. Purified from rabbit serum by sequential epitope-specific chromatography. The antibody has been negatively preadsorbed using a non-phosphopeptide corresponding to the site of phosphorylation to remove antibody that is reactive with non-phosphorylated PAK. The final product is generated by affinity chromatography using a PAK 2 derived peptide that is phosphorylated at serine 141. Our Abpromise guarantee covers the use of ab5247 in the following tested applications. WB Use a concentration of 0.1 - 1 µg/ml. Predicted molecular weight: 65 kDa. In mammals, there are several identified isoforms of p21 Activated Protein Kinases or PAKs: PAK1 and PAK3 are mostly brain specific, while PAK2 is expressed ubiquitously. Mutations of the gene coding for PAK3 are associated with X linked mental retardation and PAK3 is a key regulator of synapse formation and plasticity in the hippocampus. PAK3 is thought to play a key role in regulation of cell shape and motility as well as cell death. Induction of Activation: Extracts prepared from Cos cells transiently transfected with PAK 1 and V12 Cdc42, and kept in suspension (inactive) or as adherent cultures (active) were resolved by SDSPAGE on a 10% Tris-glycine gel and transferred to PVDF. The membrane was either not treated or treated with lambda phosphatase, blocked with a 5% BSA-TBST buffer overnight at 4°C, and then incubated with 0.50 µg/mL ab5247 antibody for two hours at room temperature in a 3% BSA-TBST buffer. After washing, membranes were incubated with goat F(ab’)2 anti-rabbit IgG alkaline phosphatase and signals were detected using the Tropix WesternStar method. Peptide Competition: Extracts prepared from Cos cells transiently transfected with PAK 1 (lanes 1-4), PAK 2 (lanes 5-8), or PAK 3 (lanes 9-12) and cotransfected with V12 Cdc42 to induce activation were resolved by SDS-PAGE on a 10% Tris-glycine gel and transferred to PVDF. Membranes were blocked with a 5% BSA-TBST buffer overnight at 4°C, then were incubated with 0.50 µg/mL ab5247 antibody for two hours at room temperature in a 3% BSA-TBST buffer, following prior incubation with: no peptide (1, 5, 9), the nonphosphopeptide corresponding to the immunogen (2, 6, 10), a generic phosphoserine containing peptide (3, 7, 11), or, the phosphopeptide immunogen (4, 8, 12). After washing, membranes were incubated with goat F(ab’)2 anti-rabbit IgG alkaline phosphatase and signals were detected using the Tropix WesternStar method. 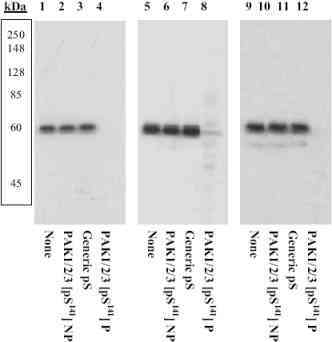 The data show that the ab5247 antibody is highly selective for the phosphorylated form of PAK, and that the antibody can be used to detect an active form of PAK 1 as well as PAK 2 and PAK 3. Publishing research using ab5247? Please let us know so that we can cite the reference in this datasheet. There are currently no Customer reviews or Questions for ab5247.